Amber Lounge is the original and world’s most exclusive Grand Prix after party that follows the F1 series around the globe. Amber Lounge Singapore delivers an overwhelming non-stop nightlife experience and has firmly established its reputation as the hottest party during the GP weekend with after parties on Saturday 15th and Sunday 16th September 2018. Celebrate alongside the international jet-set, film stars and the Formula One fraternity. 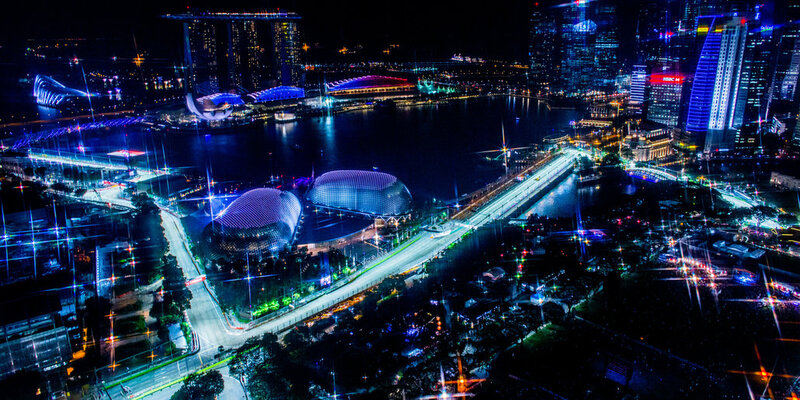 Enjoy elegant fashion shows where F1 drivers take to the catwalk, live performances by iconic artists and electrifying DJ sets. A few of it’s famous guests included Adam Levine, Adrian Grenier, Amber Le Bon, Bernie Ecclestone, Black Eyed Peas, Bob Sinclar, Bono, Cristiano Ronaldo, David Beckham, David Coulthard, David Hasselhoff, Elizabeth Hurley, Elle Macpherson, Gerard Butler, Gordon Ramsay, HSH Prince Albert II of Monaco, Jason Statham, Jennifer Lawrence, Jeremy Clarkson, Julian Lennon, Justin Bieber, Keanu Reeves, Kellan Lutz, Kim Kardashian, Kimi Räikkönen, Kylie Minogue, Lewis Hamilton, Matt LeBlanc, Naomi Campbell, Nico Rosberg, Nicole Scherzinger, Reggie Bush, Roman Abramovich, Prince Harry of Wales , Sir Richard Branson and Taio Cruz. The ultra-glamorous Amber Lounge Fashion Show and an impressive line-up of live entertainment make this one of the most anticipated events in the social calendar. Accompanied by grid girls and models, a host of F1 drivers swap the cockpit for the catwalk to showcase collections from international labels, such as La Perla, Hervé Léger, Frederick Lee, Brioni & Stefano Ricci to name a few…Following the show, the venue seamlessly evolves into the party venue of choice. Amber Lounge’s Sunday closing party is where the Formula One drivers and teams come for post-race celebrations. The most anticipated night of the weekend brings iconic live acts performing their smash hits, whilst DJ’s keep the dance floor rocking until the early hours of the morning. Strategically located in the heart of the financial and arts districts along the charming Singapore River and Marina Bay, the hotel successfully blends its illustrious heritage with contemporary style, personalized service, and excellent dining to offer a true destination experience. The hotel is located within close proximity to the circuit. Surrounded by the many attractions of Marina Bay, Mandarin Oriental offers the perfect base from which to discover the city. It is just easy walking distance to circuit and Amber Lounge. The hotel’s strategic location at the gateway to the Central Business District provides easy access for business travellers, and at the same time offers a wide array of sightseeing, retail and entertainment options in the vicinity. Hotel is located close to Amber Lounge as well as Paddock Club. Recognised as the ultimate A-List party for the racing community, situated within the track and directly across from The Paddock Club, The Podium Lounge hosts Formula 1® drivers, teams, Royalty, celebrities, ambassadors, supermodels and the glamorous personalities of Asia’s jet-setting party elite each year. The lavish Grand Prix Season After-Party is located in the stunning Grand Ballroom of the famous Ritz-Carlton, Millenia Hotel from 10pm until 4am, welcomes 2,500 guests each night and features a sizzling line-up of headline artists, fashion shows, live entertainment and high octane partying for its elite guests. All holders of Weekend Packages will receive a complimentary pass to access The Podium Lounge for the Sunday night post race party with headlining act Sky Blu from the duo LMFAO! VIP Table reservations can also be arranged. The W Sentosa Cove on Singapore’s lush resort island just minutes from the mainland’s attractions and the circuit! Sentosa features golden sandy beaches, world championship golf courses and a yachting marina just steps from the hotel which has its own pool, spa and top-rated restaurants. A three nights stay in a ‘Wonderful’ Room at The W Sentosa Cove is included with weekend hospitality bookings.